The Quest for Height: Grow Taller | Increase Height | Bone Size: Lateral Joint Loading for the Jaw? People have asked before if it's possible to do LSJL for the spine. So far LSJL has only been done for the arms and legs and there's more research done on this field. Here's a study on lateral loading for the jaw that predates the LSJL longitudinal growth studies that may provide some insight on how to grow taller via the spine or how to get a bigger jaw. Influence of extraoral lateral force loading on the mandible in the mandibular development of growing rats. "Thirty growing Wistar rats were divided into 3 groups: control, sham, and experimental. To determine longitudinal developmental changes, each animal was placed under anesthesia and immobilized in a custom-built body retainer. In the experimental group, a fixing device of aluminum was fitted to the zygomatic arch. Lateral force was then applied to the mandible with an open coil for 2 weeks. Absolute lengths and perpendicular heights from the baseline of the lower border of the mandible were measured. Lateral force induced the mandible to shift toward the nonloaded side; absolute mandibular length at menton-condylion on the side where the load was applied was greater than that in the control group. No difference from the control group was noted on the nonloaded side, and there were no significant differences in perpendicular heights. 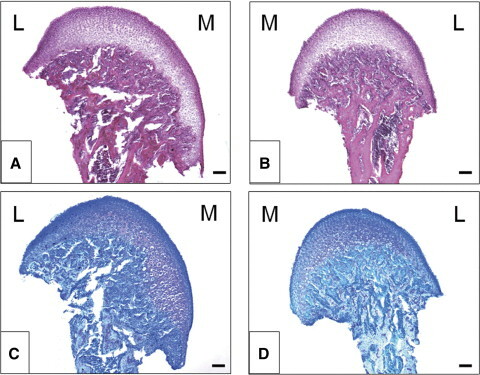 Lateral loading on the mandible resulted in histopathologic changes: (1) on the side where the load was applied, the cartilaginous zone hypertrophied in the highest margin of the condylar head, the erosive zone expanded, and the width of the mandibular neck decreased; (2) the chondrocyte layer shifted to the medial side on the nonloaded side, and cartilaginous ossification occurred in the lateral direction immediately below the chondrocyte layer, which deformed the mandibular neck toward the medial side and caused asymmetric development of the mandible." "A fixation device for loading lateral force onto the mandible was attached to the zygomatic arch. It was made of aluminum and was 7 mm wide, 50 mm long, and 0.5 mm thick. The device was fixed bilaterally to the cheek bones (horizontal to the Frankfort plane and immediately below the orbit) with a stainless steel wire with a diameter of 0.3 mm, so that the device passed under the lower border of the mandible. In the experimental group, a hole was made in the left mandibular incisor cervical area, and an open coil spring was ligated to the tooth by using a 0.25 mm stainless steel wire. The device and the coil spring were bound with a stainless screw. The force was loaded to displace the mandibular central incisor 2 mm to the right of the maxillary central incisor. The open coil spring, made of stainless steel containing nickel and chromium, measured 0.25 mm thick, 1.02 mm in diameter, and 7.0 mm long. In the load-shift curve obtained in a preliminary experiment with this coil spring, 2 mm of compression provided about a 15-g force. The direction of the force was assumed to be parallel to the Frankfort plane. "<-The force used in the LSJL studies was 0.5N which is much less force. "The lateral force loaded on the mandible was 15 g; at that level, the rats could move the mandible back to its normal position by themselves when awake. Force was loaded for 24 hours a day. "<-LSJL loading is intermittent. At 2 weeks the absolute mandibular length increased from 17 to 18. That is huge. There was no change in the control group. B and D are loaded side and A and C are non-loaded. It's hard to tell if there's any evidence of new mesenchymal chondrogenesis which would be what increases height. However, the control group did not grow at all indicating that this is not merely an increase in growth rate. So lateral loading of the mandible increases it's length and perhaps intermittent loading could provide this increase without the deformity. You could also load both sides equally.Growth can be stimulated in the mandible by lateral loading. No clamp is likely needed and you can just use your hands. Ultrasound has been tested on the condyle as well. LJSL + Vibration Plate (like powerplate) = Good Idea? "FORCE WAS LOADED FOR 24 HOURS A DAY" and 1 minute of clamping a day are RADICALLY different things. There was a still growing girl that underwent extensive traction for her spine with a chin strap pulling her head upwards for long periods of time. Her chin ended up being deformed, very small, weak-chinned looking, like it had been reabsorbed into the mandible. There was an old black and white photo of it on the internet a few years back which I can't find now. If I can find the study I'll post it here. Chin and jaw may be different but, at least in her case, the loading destroyed her chin. Maybe because the pressure was not lateral... but does prolonged non-lateral pressure have the opposite effect and destroy existing bone? This study reminds me of the studies Jose Antonio did on hyperplasia. There is a debate in bodybuilding as to whether muscle cells get bigger solely by enlarging or also splitting apart and increase in number...hypertrophy vs hyperplasia. The studies involved chronic weighted stretches to specific muscles of chickens. A quote from the study...."The total number of stretch days was 28. Using this approach produced the greatest gains in muscle mass EVER recorded in an animal or human model of tension-induced overload, up to a 334% increase in muscle mass with up to a 90% increase in fiber number."! The problem is not enlarging the jaw, but the entire skull. Enlarge only the jaw deforms the face, this seems an individual suffering from acromegaly. To have a well-proportioned body would be ideal to enlarge the skull, rib cage (ribs and sternum), shoulders (clavicles and scapulae), spine (including cervical vertebrae). Francesco, every skull is different. Some people have either a weak chin, jaw, or cheek bones. Why would they enlarge their whole skull and body skeleton instead of focusing on one weakness? 1000s of people have chin, jaw, or cheek bone implants, which enlarge those areas, and they don't look like they have acromegaly...and they don't get implants on their entire "skull, rib cage (ribs and sternum), shoulders (clavicles and scapulae), spine (including cervical vertebrae)" in order to improve one weakness. Anonymous, I'm 5'10", so an average height guy (here in Italy the average is 5'9"). But I have a small head: my head circumference is only 56 cm (22 inches, the average is 23,5) and have a normal schelic index. So increasing the length of the limbs through LSJL, I become elongated and my head is even smaller! I'll look like a freak... So, neurocranium are important as the jaw. Well, the jaw is curved so loading the chin should have some of the effects as lateral loading as a pressure gradient is generated. Axial loading normally generates a very small pressure gradient as most bones are straight with some minor curvatures. Loading the center shouldn't generate as much gradient as loading the ends. Ultimately, I'd have to see the study. What about loading on cheek bones ? So does doing lsjl on the mandible increase lenght or it will increase bone mass on the mandible so it will increase width. I feel so good to read your article of heightquest.com.its a Valiable site for all the people .I always like this website .Because here included so effective information. It may help me about related matter. I highly recommend it & like to share As an passionate muscular designer, I choose Semenax review for many aspects. Nitric Oxide items are a amazing alternative to the illegal and dangerous given that some individuals use for quick benefits. These steroids can be destructive to your overall long-term health and fitness, can create your hair reduction out, testes decrease, moreover to can eliminate you. They could also get you disallowed from your activity if they do medication analyzing. They're not value the problems they create so keep away from them and keep with items that offer you with excellent long-term benefits. I seriously recommend you analyze out XTreme NO and see if it's right for you. So where exacty should we load ?